Wake up India. It's time to not go to work. It's time to get people to work for you. 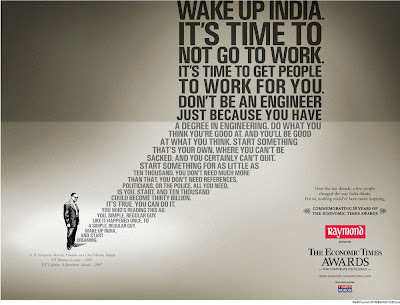 Don't be an engineer just because you have a degree in engineering. Do what you think you're good at. And you'll be good at what you think. Start something that's your own. Where you can't be sacked. And you certainly can't quit. Start something for as little as ten thousand. You don't need much more than that. You don't need references, politicians, or the police. All you need, is you. Start. And ten thousand could become thirty billion. It's true. You can do it. You who's reading this ad. You, simple, regular guy. Like it happened once, to a simple regular guy. Wake up India. And start dreaming. Over the last decade, a few people changed the way India thinks. For us, nothing could've been more inspiring.